STORRS — University of Connecticut Police arrested the White House correspondent from a conservative website after he grabbed a woman who took his speech papers from his podium during a guest lecture Tuesday night, officials say. Gateway Pundit correspondent Lucian Wintrich followed the woman as she walked back into the audience and an altercation broke out when he used physical force while trying to retrieve his papers from her. 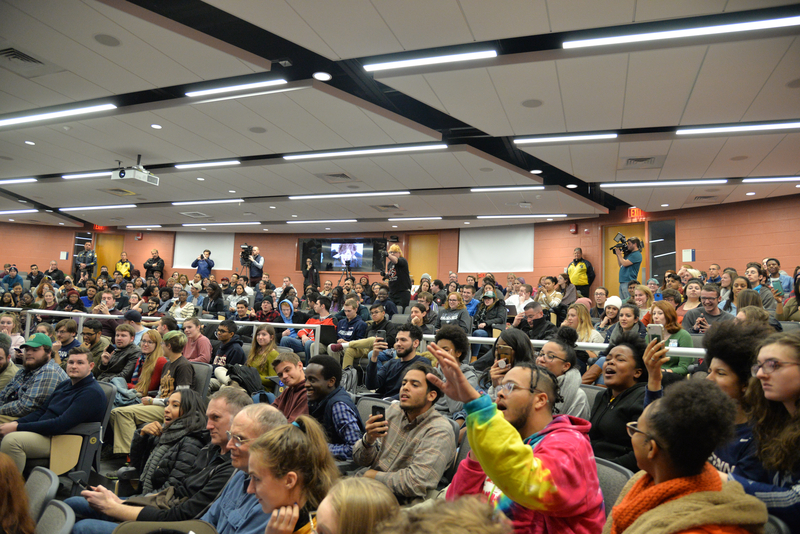 Authorities removed Wintrich from the room in the Andre Schenker Lecture Hall around 9 p.m. and also forced the more than 300 attendees to leave the building. About an hour later police rushed Wintrich out the front exit and into an unmarked car as dozens of protesters chased on foot while shouting expletive phrases. 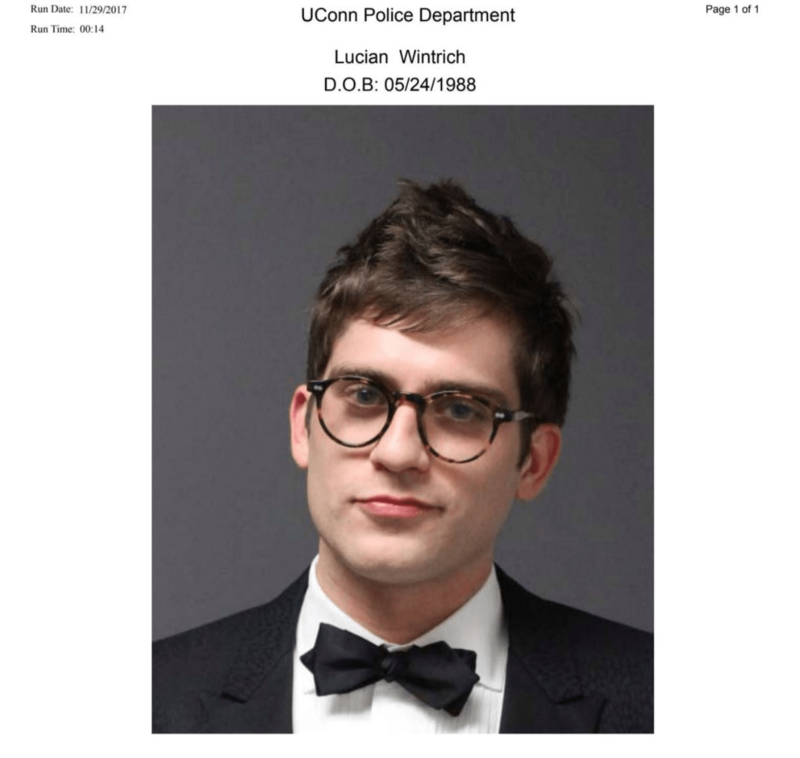 Police charged Wintrich, 29, with breach of the peace, a misdemeanor, and released him late Tuesday on no bail, according to his Wednesday night interview with the Daily Campus. Wintrich tweeted Wednesday identifying the woman who took his papers as UConn alumna Catherine Gregory, who is the associate director of Career Services and Advising at Quinnebaug Valley Community College in Danielson, Connecticut. UConn Coalition for Social Justice President Rebecca Kaufman says she thinks Wintrich assaulted Gregory and that he deserved to be arrested. “Honestly I think it’s just indicative of a larger culture of toxic masculinity and this whole culture of structural violence that’s going on right now,” Kaufman says. The UConn College Republicans sponsored the lecture, called, “It Is OK to Be White.” The group wrote on Facebook Tuesday that several of their flyers were removed or modified before the event. “It is sad that our fellow students at UConn have to take down or modify Lucian Wintrich’s posters because they disagree with free speech and individualism. Don’t worry, we put more up!” the group says. During his talk, Wintrich says that half of Americans “normalize aggression” against conservatives or Trump supporters and justify it by calling them “Nazis.” He also describes what he says are two distinct versions of the United States that currently exist. Scores of audience members booed the 29-year-old commentator and chanted phrases such as “Go home Nazis,” “Black lives matter,” and “F**k you.” One attendee shouted “I hope you get killed” after Wintrich referred to a woman as “this fat girl” while telling a personal story. 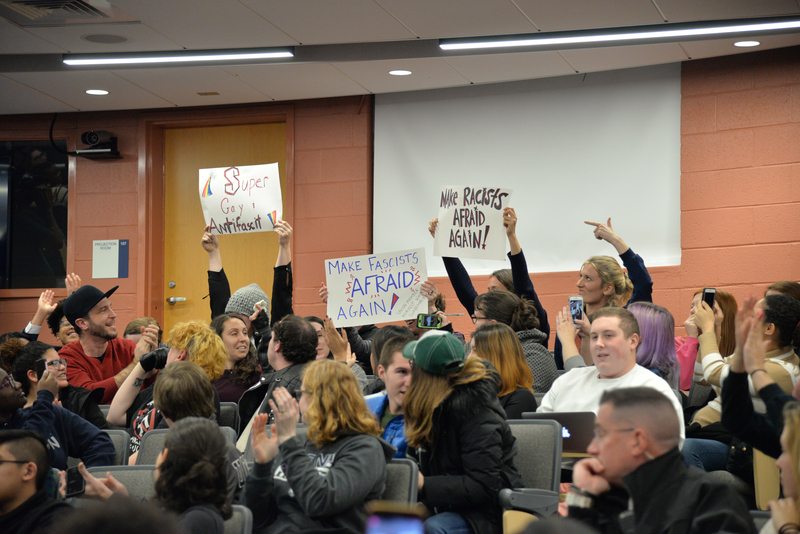 Audience members hold up signs in protest during Wintrich’s speech. One event attendee who asks to remain anonymous says he thinks it’s understandable that Wintrich reacted how he did after Gregory took his speech papers from the podium. Rosalinda Patino, a UConn junior, says she didn’t know anything about Wintrich before the event and wanted to “see what he’s about.” The junior says she thinks that everyone should have freedom to speak regardless of what they say. Another UConn junior, Noah O’Connor, says he thinks that Wintrich cannot argue that the audience suppressed his freedom of speech because he was engaging with them directly. 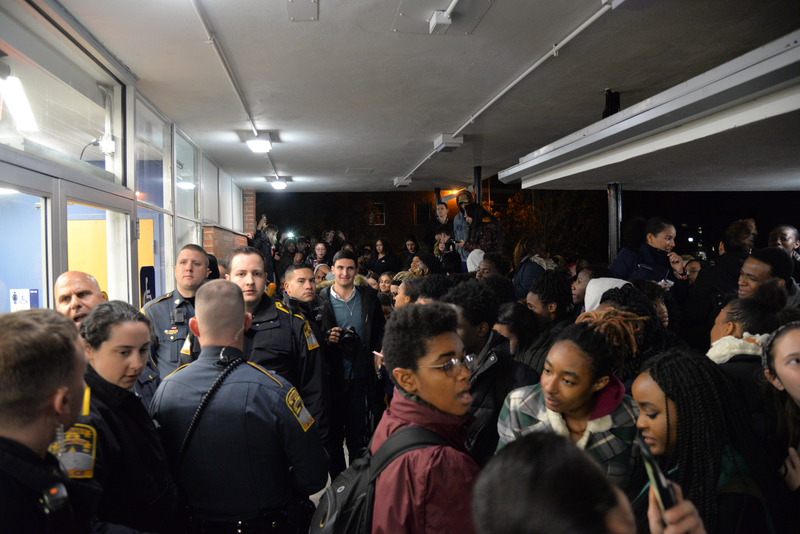 After police had arrested Wintrich and moved him out of sight around 9 p.m., more than 100 protesters gathered outside the rear entrance of Schenker Hall waiting to see him come back out. As multiple UConn Police officers were guarding the entrance, someone broke one of the nearby windows and threw a smoke bomb that detonated in the hallway. Fire alarms went off and the UConn Fire Marshal arrived to allow Wintrich to remain inside. The person who threw the bomb ran away and police are still investigating the incident. Another protester broke a second window but police didn’t immediately identify who did it. They later arrested UConn student Sean Miller, 19, of Glastonbury, Connecticut and charged him with breach of the peace and criminal mischief. Police released Miller Tuesday night on a $1,000 bond, says Reitz. Ernest Dunham, a UConn senior, says a police officer grabbed him and tried to pull him while he stood among other protesters outside the doors. Numerous UConn students have expressed outrage in public Facebook posts, asking why the event was allowed and saying it is “racist,” “white supremacist,” and “hateful,” among other adjectives. The College Republicans Executive Board released a statement Thursday regarding the event. UConn President Susan Herbst also issued a statement Thursday via email and says all school organizations are free to invite speakers and reserve space for programming, but that they should anticipate the outcomes.